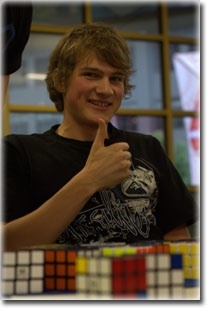 December 15, 2011 : Interview with Speedsolving.com member Zane Carney : Currently (at the time of this interview) holds the world record in 3x3x3 Multi-Blind (23/25 cubes in 57:48), is ranked 4th in the world in 3x3x3 Blindfolded (31.41 seconds), and is the 2011 World Champion in 3x3x3 Blindfolded. I live in a rural area called Gherang, it’s around 100km west of Melbourne, Australia. I’ll say 3x3 blindfolded. Besides being quite a short event, one of the reasons I enjoy it is because of commutators. Intuition is fun and creates more of an accomplishment than solving with brain-dead memorised algorithms. Another reason is I find the mnemonic systems interesting, and they can sometimes be applied to non-cubing situations. Also, due to me using images to memorise edges, 3x3 BLD benefits both multi and big cubes BLD. Around mid-2008, my dad found an old cube at home. We decided to buy a new Rubik’s cube from Toys R Us. After a week, I learnt how to solve it using a LBL method in the solution booklet. I began timing my solves, but lost interest after a few months. A while later in July 2009, I realised I was never good at cubing and solving from the ‘memorised instructions’ wasn’t skilful at all. This random thought motivated me to get back into cubing and do it properly. I’ve been cubing since. Becoming 3x3 BLD world champion at WC 2011. It was an amazing feeling to know I performed my best at the most important time. I enjoy going outside, just about every night I go for a run. Other activities I do include climbing, shooting and fishing. I love learning about the natural world/universe and reading random science. Littering and babies crying. I also find it annoying when naive people are conned into scams and expect sympathy. I think in a few years the rate at which world records are broken will have greatly decelerated. Perhaps the ‘human limits’ of cubing aren’t that far away. The rankings will become extremely tight between the top cubers and I expect there to be more people tied on world records. I hope cubing continues to be regarded as a fun hobby rather than a competitive sport. Definitely World Championship 2011. This was my first time overseas, so Bangkok itself was a very interesting experience. It was awesome to finally meet some really great people in person. The competition was both a friendly and competitive atmosphere.